The technique of the drawing is identical to that of 1 and 3 (110/32 and 36), although each is drawn to a slightly different scale. 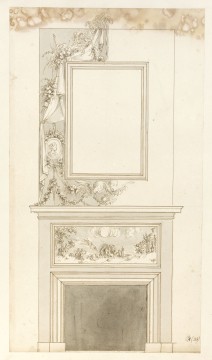 The drapery is made to fit precisely within the frame of the overmantel and is overlapped by the ribbons from which all the decorative features are hung. Gibbons probably intended to execute this entire relief in limewood, as a bravura exercise in trompe l'oeil carving.